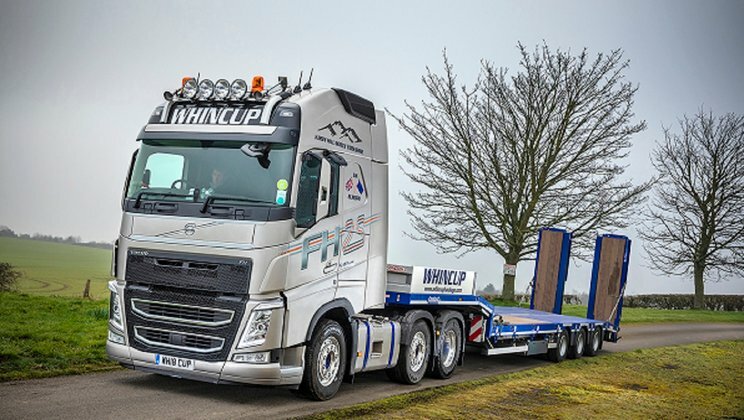 North Yorkshire-based, Whincup & Sons Ltd has taken delivery of a Volvo FH 25-Year Special Edition tractor unit to mark its 30th anniversary in business. From there Brian went onto a Volvo F10, then an F12, so when he started his own business it was only natural what Brian’s first truck should be; another F12. That Volvo was bought used and initially deployed on traction-only work pulling for European operator, Houseman International, in nearby Harrogate. With their own anniversary just around the corner, Jonny Devlin, Transport Solutions Executive at Volvo Truck and Bus Centre North & Scotland, offered the company a chance to buy an FH 25-Year Special Edition tractor unit and they jumped at it – and not just because of its livery. “It’s got everything we want on it as well,” Brian says. Along with the D13K engine rated at 540hp and I-Shift Dual Clutch transmission system, it also features Volvo Dynamic Steering. The company now consider these unique Volvo components as part of its standard specification alongside full air suspension and I-Park Cool. “We do everything from long-haul European work to local, day-to-day general haulage. So the more tools you have in your toolbox the better,” Brian notes. Whincup & Sons have ordered I-Shift Dual Clutch gearboxes on their last FH three tractor units because they like its unrivalled change speed and smoothness in operation. They also came to embrace Volvo Dynamic Steering after trying it on an ex-demonstrator FH purchased in 2018.